For Juddson Updike, playing Bert in “Mary Poppins” was a dream role. 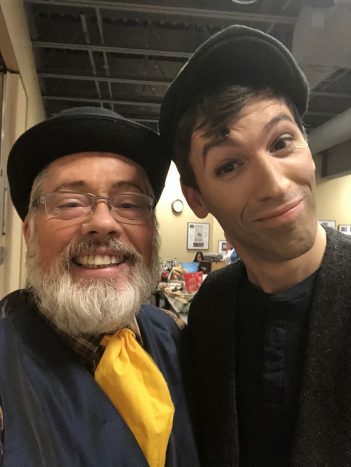 Although it’s not how he wanted to get the role, the Carmel resident did play Bert at Grace Church’s recent production at its Noblesville campus. On the opening Oct. 26 show, Troy Johnson, who was playing Bert, broke his leg near the end of the performance. At that same time, Updike, 28, was performing in his second-to-last performance of Civic Theatre’s “Anything Goes” at The Tarkington in Carmel. His parents, Jim and Melinda Updike, were both performing in the “Mary Poppins” performance and informed him Johnson was injured. Late that night, Updike got a call from the musical organizers. Updike had previously auditioned for the role of Bert at Grace. A morning show had been scheduled for Oct. 27 at Grace but was moved to the afternoon of Oct. 28. Updike spent seven hours rehearsing the basics Oct. 27. He left to perform at Civic. He returned 25 minutes before the 8:30 p.m. show at Grace. Updike then had some more time to prepare before the final six performances.